The Mountain Leader Training (MLT) is a 6-day course. The Mountain Leader Assessment (MLA) is 5-days and includes a two night expedition. 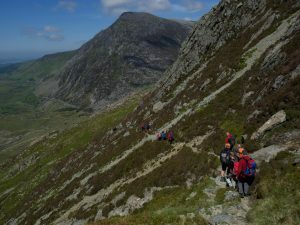 The Mountain Leader scheme offers the opportunity to gain technical competence in leading walkers in the hills and mountains. It does not provide a rock climbing qualification, nor does it cover the skills required for the planned use of the rope. Completion of a training course, without a pass result at assessment, is not a qualification in itself. It is the combination of technical skills, wide experience and personal leadership qualities, which form the basis for effective group management, and the scheme assesses all these aspects. The scheme is intended for those leading groups in mountainous or remote country. For a full list of areas in the UK and Ireland defined as mountainous country see Appendix 1 of the Handbook.